Appreciation of the importance of biodiversity preservation is the fundamental reason for establishing the WE Label. We know that European habitats are becoming threatened by a variety of factors such as fragmentation, degradation and destruction. This is due to changes in land-use, intensification and conversion of production systems, abandonment of traditional practices which are often biodiversity-friendly, infrastructure developments, urbanization, and lack of funds to support rural communities. Other key pressures include pollution and the spread of invasive alien species. Climate change may potentially add to the existing stress on the ecosystems that are vital for society. It is absolutely essential to halt biodiversity loss in order to restore the ability of ecosystems to adapt to climate change. In the face of these challenges, WE have succeeded in creating and improving habitats in favour of biodiversity, as well as in restoring natural conditions where game species can thrive. We were only able to achieve that due to enormous collaboration from Europe’s farmers, foresters, hunters and anglers, who all are indirect producers of wild flora and fauna. They are the key link to achieving sustainable rural development. 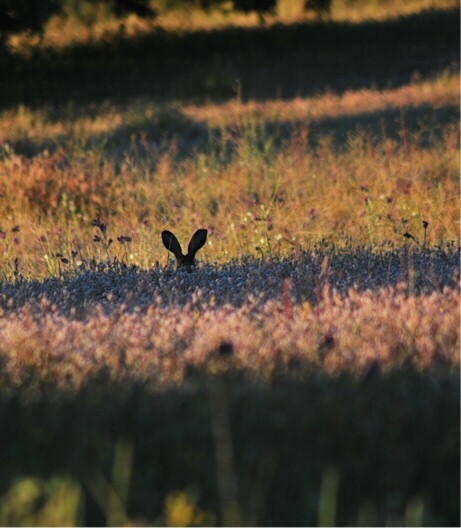 The concept of “conservation through wise use” embraces not only responsible exploitation of wildlife via rural activities, but also the spiritual value of wildlife to the society as a whole. This concept recognizes the role of active and positive management. It is based on the ability to deploy a package of legitimate measures designed to manage wildlife. These activities are either targeted at enhancement of the survival and productivity of certain species so as to expand their population, or to manage their abundance in order to reduce their impact on other species or ecosystem services. Rural estates are crucial in supporting rural economies, which in turn play a significant role in overcoming the world’s food, energy and environmental challenges. Therefore, even if financial support to the rural sector is retreating, complementary private initiatives and private financing instruments of rural development are called for in order to enhance sustainable rural development. As environmental degradation accelerates, the role of private land managers becomes increasingly important in preserving nature and landscapes through good management practices. This is why the WE Label has sought to facilitate collaboration between private and public actors. It has done so, in order to illustrate that the work undertaken by landowners is very much in line with the fundamental philosophy of biodiversity conservation. to spread important information about wildlife management for educational, decision-taking, and policy-making purposes. 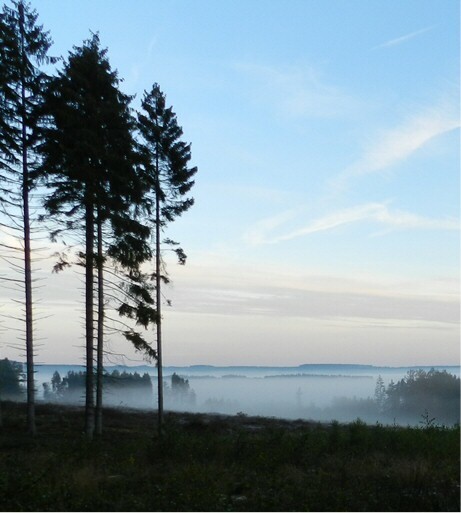 The WE project is one of the activities of European Landowners' Organization offering the opportunity to work with the European Commission as a partner. Thus, the Wildlife Estate Label structure is also a policiy instrument through which the views of our members are heard and taken into account when important changes in the European legislation are decided. The Wildlife Estates (WE) Label was conceived in 2005, when key actors from national authorities and private organisations from areas related to nature conservation and land management took the opportunity to develop a philosophy entwining the concepts of wildlife management and sustainable land use. Since then, the project has expanded progressively to promote biodiversity conservation in the face of emerging political, economic and social concerns at both the EU and local levels. The network of labelled estates started with Spain, Belgium, France, Portugal and the Netherlands, and has been continuously enlarging ever since. Currently, Western countries such as Spain, Portugal, Sweden, France, Belgium and the region of Scotland have the most representatives. As the project grew, the establishment of National Delegations became necessary, which in turn resulted in even further increased recognition and publicity of the initiative in each participating country. Growth of the initiative was paralleled with the development of evaluation grids for each biogeographic region (Mediterranean, Boreal, Alpine and Continental). In October 2018, the WE Label is represented in 19 countries with 330 labelled estates covering 1,616,881 ha in various biogeographic regions. The sizes of labelled estates range from small holdings a few tens of hectares to commercial estates covering houndreds of thousands of hectares. Nevertheless, they are all fundamentally united in their goals to preserve and enhance their natural, cultural and social environment. Since its creation, the WE Label has been facilitating collaboration between private and public actors in order to illustrate that the work undertaken by land managers is very much in line with the central tenets of biodiversity conservation. This has involved the creation of National Delegations to engage with both private and public actors, such as NGOs, administrative bodies, universities, independent scientists, and even companies. The WE Label is currently represented in 19 European countries mostly through a decentralized network. The Wildlife Estates secretariat is situated in Brussels, Belgium whereby it coordinates the activities of the National WE-Delegations. The European Landowners’ Organization (ELO), created in 1972, is a unique federation of national associations from the EU28 and beyond representing the interests of landowners, land managers and rural entrepreneurs at the European Union level. The organization promotes a sustainable and prosperous countryside through private ownership, public-private initiatives, responsible land management, and family business. As an independent, non-profit organization, the ELO represents all rural entrepreneurs. Such a broad scope of representation gives it unmatched presence and credibility in it relation with European decision makers, at the highest level. To advance its position, ELO has developed a lobbying strategy, manages think tanks, and is involved in international conferences, workshops and action programmes. The effectiveness of the organization relies on its ability to gather rural actors and political decision makers at a local, regional, national and pan-European levels. Not only does ELO raise the interests and concerns of their stakeholders, but also provides insight into the local effects of implementing EU legislation such as the promotion of sustainable management practices through the WE Label. 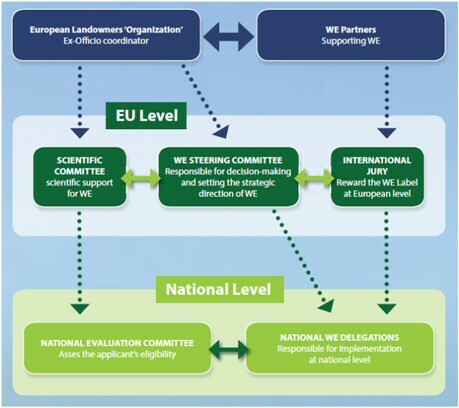 The general aim of the Scientific Committee is to facilitate the creation and validation of an objective methodology for the WE Label in each country. It is a scientific board that advises national delegations on matters relating to the methodology. This Committee is composed of eight highly qualified experts from the different biogeographic regions of the EU: Macaronesian, Mediterranean, Atlantic, Continental, Pannonian, Boreal, Arctic, and Alpine. They assess the validity of the different scientific criteria and principles that embody the core principles of the WE Label.